Azure Kubernetes Service (AKS) は、クラスターをすばやくデプロイおよび管理することができる、マネージド Kubernetes サービスです。Azure Kubernetes Service (AKS) is a managed Kubernetes service that lets you quickly deploy and manage clusters. 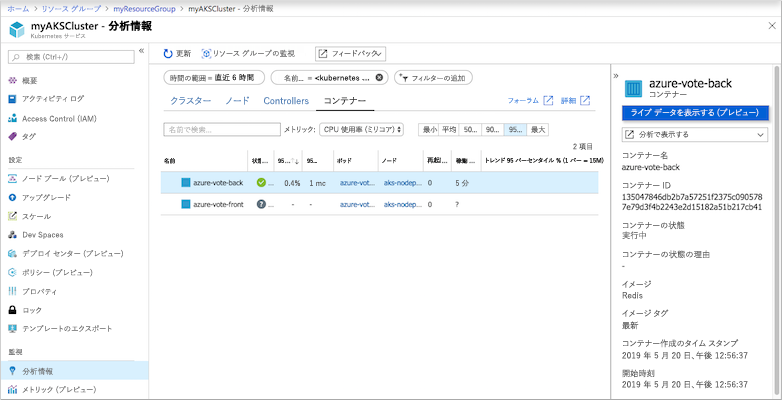 このクイック スタートでは、Azure CLI を使用して AKS クラスターをデプロイします。In this quickstart, you deploy an AKS cluster using the Azure CLI. このクラスターで、Web フロント エンドと Redis インスタンスが含まれている複数コンテナー アプリケーションが実行されます。A multi-container application that includes a web front end and a Redis instance is run in the cluster. その後、アプリケーションを実行するクラスターとポッドの正常性を監視する方法を示します。You then see how to monitor the health of the cluster and pods that run your application. このクイックスタートは、Kubernetes の基本的な概念を理解していることを前提としています。This quickstart assumes a basic understanding of Kubernetes concepts. 詳細については、「Azure Kubernetes Services (AKS) における Kubernetes の中心概念」を参照してください。For more information, see Kubernetes core concepts for Azure Kubernetes Service (AKS). CLI をローカルにインストールして使用する場合、このクイック スタートを実施するには、Azure CLI バージョン 2.0.52 以降を実行している必要があります。If you choose to install and use the CLI locally, this quickstart requires that you are running the Azure CLI version 2.0.52 or later. バージョンを確認するには、az --version を実行します。Run az --version to find the version. インストールまたはアップグレードする必要がある場合は、Azure CLI のインストールに関するページを参照してください。If you need to install or upgrade, see Install Azure CLI. Azure リソース グループとは、Azure リソースのデプロイと管理に使用する論理グループです。An Azure resource group is a logical group in which Azure resources are deployed and managed. リソース グループを作成する際は、場所を指定するよう求められます。When you create a resource group, you are asked to specify a location. この場所は、リソース グループのメタデータが格納される場所です。リソースの作成時に別のリージョンを指定しない場合は、Azure でリソースが実行される場所でもあります。This location is where resource group metadata is stored, it is also where your resources run in Azure if you don't specify another region during resource creation. az group create コマンドを使用して、リソース グループを作成します。Create a resource group using the az group create command. 次の例では、myResourceGroup という名前のリソース グループを eastus に作成します。The following example creates a resource group named myResourceGroup in the eastus location. AKS クラスターを作成するには、az aks create コマンドを使用します。Use the az aks create command to create an AKS cluster. 次の例では、myAKSCluster という名前のクラスターを 1 つのノードで作成します。The following example creates a cluster named myAKSCluster with one node. 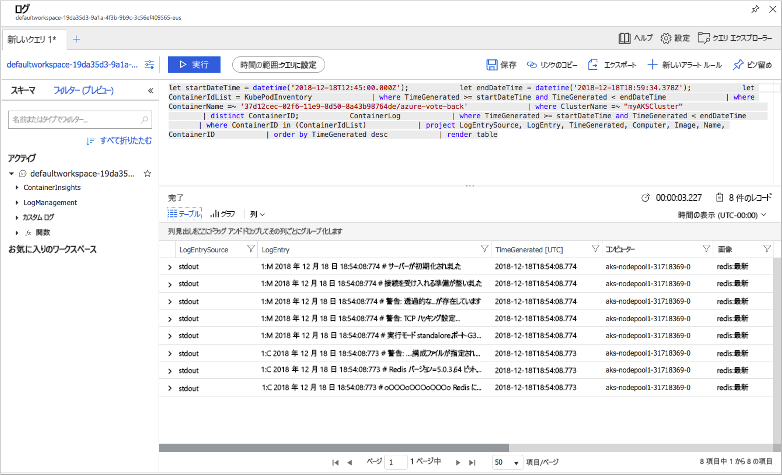 コンテナーの Azure Monitor は、--enable-addons monitoring パラメーターを使用して有効にすることもできます。Azure Monitor for containers is also enabled using the --enable-addons monitoring parameter. 数分後、コマンドが完了し、クラスターに関する情報が JSON 形式で返されます。After a few minutes, the command completes and returns JSON-formatted information about the cluster. Kubernetes クラスターに接続するように kubectl を構成するには、az aks get-credentials コマンドを使用します。To configure kubectl to connect to your Kubernetes cluster, use the az aks get-credentials command. このコマンドは、資格情報をダウンロードし、それを使用するように Kubernetes CLI を構成します。This command downloads credentials and configures the Kubernetes CLI to use them. クラスターへの接続を確認するには、kubectl get コマンドを使って、クラスター ノードの一覧を取得します。To verify the connection to your cluster, use the kubectl get command to return a list of the cluster nodes. Kubernetes のマニフェスト ファイルでは、どのコンテナー イメージを実行するかなど、クラスターの望ましい状態を定義します。A Kubernetes manifest file defines a desired state for the cluster, such as what container images to run. このクイック スタートでは、マニフェストを使用して、Azure Vote アプリケーションを実行するために必要なすべてのオブジェクトを作成します。In this quickstart, a manifest is used to create all objects needed to run the Azure Vote application. このマニフェストには、Kubernetes デプロイが 2 つ含まれます。サンプル Azure Vote Python アプリケーション用と Redis インスタンス用です。This manifest includes two Kubernetes deployments - one for the sample Azure Vote Python applications, and the other for a Redis instance. さらに、Kubernetes サービスが 2 つ作成されます。Redis インスタンスに使用される内部サービスと、Azure Vote アプリケーションにインターネットからアクセスするための外部サービスです。Two Kubernetes Services are also created - an internal service for the Redis instance, and an external service to access the Azure Vote application from the internet. このクイック スタートでは、アプリケーション マニフェストの作成と AKS クラスターへのデプロイを手動で行います。In this quickstart, you manually create and deploy your application manifests to the AKS cluster. より現実に即したシナリオでは、Azure Dev Spaces を使用することで、反復作業を迅速化し、AKS クラスター内で直接、コードをデバッグすることができます。In more real-world scenarios, you can use Azure Dev Spaces to rapidly iterate and debug your code directly in the AKS cluster. Dev Spaces は、OS プラットフォームと開発環境の垣根を越えて使用でき、チーム内の他のメンバーと連携することができます。You can use Dev Spaces across OS platforms and development environments, and work together with others on your team. アプリケーションが実行されると、Kubernetes サービスによってアプリケーション フロント エンドがインターネットに公開されます。When the application runs, a Kubernetes service exposes the application front end to the internet. このプロセスが完了するまでに数分かかることがあります。This process can take a few minutes to complete. 進行状況を監視するには、kubectl get service コマンドと --watch 引数を使います。To monitor progress, use the kubectl get service command with the --watch argument. 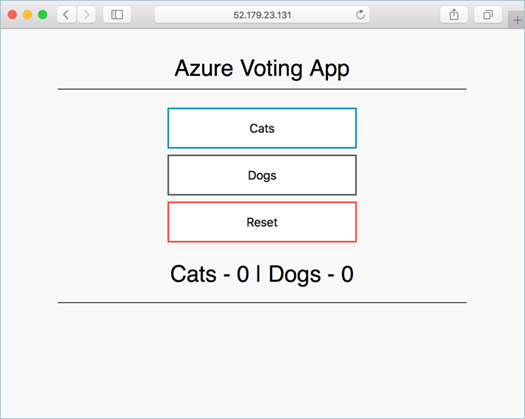 最初に、azure-vote-front サービスの EXTERNAL-IP が "保留中" として表示されます。Initially the EXTERNAL-IP for the azure-vote-front service is shown as pending. Azure Vote アプリが動作していることを確認するには、Web ブラウザーを開いてサービスの外部 IP アドレスにアクセスします。To see the Azure Vote app in action, open a web browser to the external IP address of your service. AKS クラスターが作成されたとき、クラスター ノードとポッドの両方の正常性メトリックを取得するために、コンテナーに対する Azure Monitor が有効になりました。When the AKS cluster was created, Azure Monitor for containers was enabled to capture health metrics for both the cluster nodes and pods. これらの正常性メトリックは、Azure portal で利用できます。These health metrics are available in the Azure portal. Web ブラウザーで、Azure portalhttps://portal.azure.com を開きます。Open a web browser to the Azure portal https://portal.azure.com. リソース グループ (たとえば、myResourceGroup) を選択し、次に AKS クラスター (たとえば、myAKSCluster) を選択します。Select your resource group, such as myResourceGroup, then select your AKS cluster, such as myAKSCluster. コンテナーの表示を選択します。Choose to view the Containers. azure-vote-front ポッドのログを表示するには、コンテナーの一覧の右側にある [コンテナー ログの表示] リンクを選択します。To see logs for the azure-vote-front pod, select the View container logs link on the right-hand side of the containers list. これらのログには、コンテナーからの stdout ストリームと stderr ストリームが含まれます。These logs include the stdout and stderr streams from the container. クラスターが必要なくなったら、az group delete コマンドを使って、リソース グループ、コンテナー サービス、およびすべての関連リソースを削除してください。When the cluster is no longer needed, use the az group delete command to remove the resource group, container service, and all related resources. クラスターを削除したとき、AKS クラスターで使用される Azure Active Directory サービス プリンシパルは削除されません。When you delete the cluster, the Azure Active Directory service principal used by the AKS cluster is not removed. サービス プリンシパルを削除する手順については、AKS のサービス プリンシパルに関する考慮事項と削除に関するページを参照してください。For steps on how to remove the service principal, see AKS service principal considerations and deletion. このクイック スタートでは、Kubernetes のデプロイを作成するために、事前に作成したコンテナー イメージを使用しました。In this quickstart, pre-created container images were used to create a Kubernetes deployment. 関連するアプリケーション コード、Dockerfile、および Kubernetes マニフェスト ファイルは、GitHub で入手できます。The related application code, Dockerfile, and Kubernetes manifest file are available on GitHub. このクイック スタートでは、Kubernetes クラスターをデプロイし、そこに複数コンテナー アプリケーションをデプロイしました。In this quickstart, you deployed a Kubernetes cluster and deployed a multi-container application to it. 先ほど作成したクラスターの Kubernetes Web ダッシュボードにアクセスします。Access the Kubernetes web dashboard for the cluster you just created. AKS の詳細を参照し、デプロイの例の完全なコードを確認するには、Kubernetes クラスター チュートリアルに進んでください。To learn more about AKS, and walk through a complete code to deployment example, continue to the Kubernetes cluster tutorial.